Mid Coast Hospital recently celebrated completion of the $6.2 million renovation and opening of the Parkview Campus. Combined with other projects, more than 44,000 square feet of the former hospital building have been reconditioned, now featuring an eight-provider primary care practice, a wellness education center, a comprehensive cancer care center, and administrative spaces. The project was funded through a combination of debt financing and philanthropy. Harpswell residents Frank, Anne, and Frank Crooker, Jr. donated $1 million to benefit the Mid Coast Center for Community Health & Wellness. The wellness center—a 9,000-square foot area that brings Mid Coast Hospital wellness programs, education, and resources under one roof—is now officially named the Frank, Anne, and Frank Crooker, Jr. Wellness Center. The wellness center offers quality health information, education, and resources to help with preventing and managing chronic disease. Programs offered by the center focus on cardiac and pulmonary rehabilitation, medical exercise, weight loss, stress reduction, and tobacco cessation. New initiatives include medical exercise for cancer, stroke, and other chronic diseases, as well as a full array of cooking classes now available in the teaching kitchen. 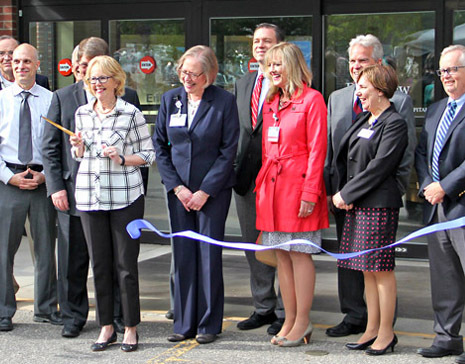 A cornerstone of the renovation is a brand new cancer center which is part of the MaineHealth Cancer Care Network, offering comprehensive cancer care in affiliation with MaineHealth. Brunswick residents, Sandy Morrell Rooney and Chuck Rooney donated $500,000 toward the completion of the cancer care center. Anchored by Mid Coast Medical Group–Cancer & Blood Disorders—a three-provider medical oncology practice—the new cancer center allows patients easy access to cancer-related services in one space, including medical oncology, infusion, laboratory, and medical exercise. A cancer resource center, affiliated with the American Cancer Society, is also available. In addition to the wellness and cancer centers, the renovation includes a 10,000-square foot primary care practice offering routine and preventive care for children and adults. Mid Coast Medical Group–Family Practice at Parkview includes eight physicians and more than 20 support staff, all working to provide patients with a foundation of health and wellness. The practice was built to accommodate delivery of preventive and chronic disease care, as well as integrated behavioral health counseling. This advanced model of adult care, known as a Patient-Centered Medical Home, is proven to improve patient outcomes and lower costs of healthcare. Services: Annual check-ups, pediatric well child visits, management of acute and chronic illnesses, referrals to specialists, medication management, integrated behavioral health counseling, and Medicare annual wellness visits. Services: Medical hematology and oncology, nurse navigators, care coordination, referrals, symptom management, and palliative care consultation. Copyright 2019. Mid Coast–Parkview Health. All rights reserved.